It’s a weeknight during UNH’s winter break, and the new Saxbys café is closed for business, but one light is still on. Trisha Crowe ’17, café executive officer (CEO) of the Durham location, sits in the empty café with her laptop, crunching numbers. The spot she’s camped out in, a table tucked into the café’s front corner, has significance for her—it’s the spot where she and her Saxbys company mentor, fellow café executive officer Lizzy Marcotte, would gather to train Trisha for her current role in the weeks before the café opened. Although she is only twenty-two years old and just completed her undergraduate degree last May, in this position Crowe is responsible for everything related to the Durham café, including operations, payroll, marketing, revenue, even the location’s charitable partners. She even got to choose some of the décor—you can thank her for the colorful murals spanning the walls, the work of her favorite artist, Rye-based painter Sam Malpass. Flipping the traditional business model, Saxbys gives this kind of freedom—and its associated responsibility—to their café executive officers. As company CEO Nick Bayer said on the opening day of the Durham café, he works for Crowe, not the other way around. In exchange for this trust and support, Crowe travels to the company’s Philadelphia headquarters every month to present to Bayer and her fellow café executive officers on the success of her café. While many new grads would have been intimidated by this kind of opportunity, Crowe felt ready and excited. “I’ve been working since I was fourteen. My parents wanted me to work and make my own money, so I learned early on the importance of working hard, and I just never stopped,” she said. 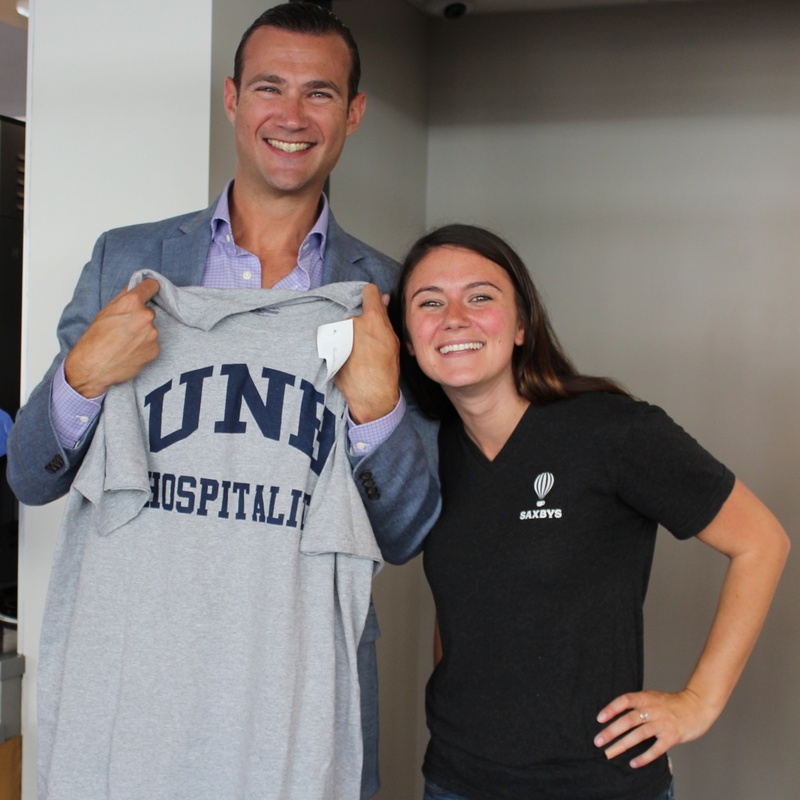 When she got to UNH, this work ethic powered her through. She took an internship at the Loveless Café in Nashville the summer after her freshman year. After that, she worked her way up from server to restaurant manager at the Wentworth by the Sea resort in New Castle, ending her undergraduate career by landing the coveted position of general manager in the Gourmet Dining Series, the hospitality management senior capstone course.